You are free to remix, tweak, and build upon this work non-commercially, and although new works must also acknowledge the author or licensor and be non-commercial. New works do not have to be licensed on the same terms. LIQUID SPACE is the interactive creature that becomes physically bigger, smaller, and brighter in relation to human behavior. The organic fusion of mechanisms, embedded electronics, sound, and LEDs creates a playful dialogue with visitors. LIQUID SPACE 6.0 premiered in Japan as a commission for the Yamaguchi Center for Arts and Media. 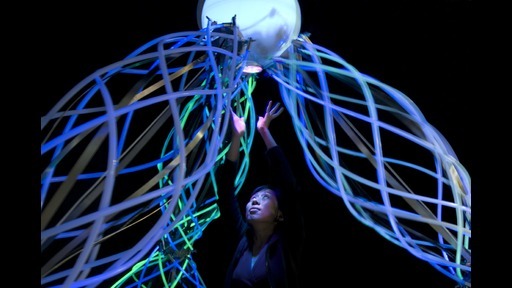 Its ‘high-tech jellyfish’ behavior evolves in relation to visitors, creating a sensual coexistence. LIQUID SPACE 6.1 landed on the island of Terschelling NL for Oerol Festival. In the middle of a dark forest LIQUID SPACE established an almost otherworldly connection with visitors; creating a futuristic merge of humans, technology, and landscape. Specifications: 2008-2010. Object, length 400 cm, width 400 cm, height 300 cm. Tubes, sensors, LEDs, mechanism, embedded electronics and software. Commissioned by Yamaguchi Center for Arts and Media, Yamaguchi JP and Atelier Oerol, Terschelling NL.